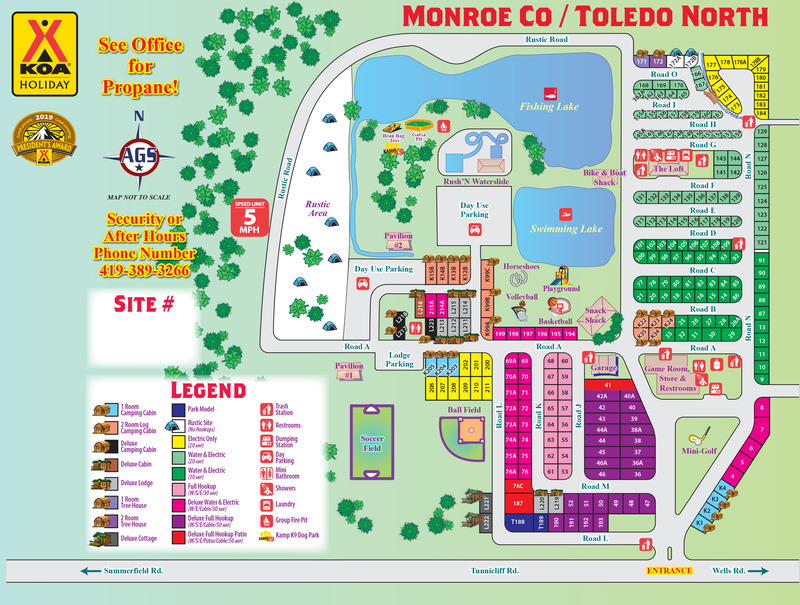 Ask fellow campers about "Monroe Co. / Toledo North KOA" and nearby attractions. Was fun for Halloween, looks like it would be lots of fun in the summer. Sites were grass/dirt and mostly level, power and water were good. My only complaint was the pet fee $5 a night per dog (we have 3) was too much! The dogs only left our site once for a walk, and we pick up with our own bags, no nice grass at site to damage, so why that cost? It cost us $75 just for the dogs during our stay. :( Liked the park, but not sure we'd return because of the high pet fee. We camped at Monroe Co. / Toledo North KOA in a Motorhome. Didn't appear any services very close, but the park store and snack shack had lots of variety. The staff were all super nice and helpful. If it rains, watch for lots of mud. This was our second time at this CG. The location, near Ann Arbor, works well for us. We were here about 10 years ago and some things have changed since then--not all for the good. To their credit they have a very nice looking sandy beach and waterslide area that looks like it would be a big hit with the kids. There's plenty of room to take dogs for a nice walk and they have a fenced in dog park. The sites are dirt and grass and mostly level-ish. There are lots of trees which we like. They don't appear to obstruct any of the sites. The park is right off the highway and easy to access. The traffic noise is not a problem. More like "white noise" during the night. It didn't disturb our sleep. However, the sites are very close together and I wouldn't want to be here in July or August when it's very crowded. Also, even with only a few other campers, the water pressure was low. There was no cap on our sewer connection and according to my husband, the washrooms/showers at the laundry area--including the laundry area--were dirty. We camped at Monroe Co. / Toledo North KOA in a Travel Trailer. Average access but campsites were tight and departure was difficult. Old campground dressed up with a swimming lake and a water slide. Expensive. They have three pull thru sites and only two 50 amp site. Service at check in was unprofessional. It was rushed and often interrupted at the same time. We stayed one night. The only night in30 years of camping that I had to call security. A lengthy and memorable issue. Will not stay there or recommend it for big rigs. ( we are 40') We camped at Monroe Co. / Toledo North KOA in a Motorhome. We love this park, we've stayed several times. normally we stay in the water electric section which is much nicer than the full hook up. FHU sites are pretty small and close together, but we stayed during the week when it wasn't too busy so it wasn't bad. The W/E sites are nicer and larger. This is very much a campground for kids. If you don't have kids, I can see why you wouldn't camp here. But it you do have kids, there is lots for them to do. The water slide is great (and doesn't cost extra, so that's nice). The teenagers enjoyed it, though it's a bit slow for them. I like it because we can bring the little ones down the slide on our lap, so they get to enjoy it to. The swimming beach is nice and big, lots of room to swim. It is a sandy beach, however don't think so much beach sand, it's a little dirtier than that. Still fine for kids to play in, but just adjust your expectations accordingly. Playgrounds are great, bike rentals, fishing, sports fields to play on are all great. Giant outdoor chess and checkers set is fun too. Mini golf is super basic, but again it doesn't cost extra, so the kids enjoyed it. Bathrooms were clean. I only used the ones at the front of the park, so I couldn't say about the ones further back. Pancake breakfast every morning is nice, pancakes are free and you can buy bacon and sausage also, which is decent and reasonably priced. Staff was helpful and friendly. All in all, we haven't found too many campgrounds that have so much for the kids to do. They have additional activities throughout the day for kids also. It's a bit pricey for us because we have so many kids, but we think it's worth it. We camped at Monroe Co. / Toledo North KOA in a Travel Trailer. We try hard to stay in koa s on our 4 month tour because we are usually never disappointed. Today we arrived here the park is pretty empty but they put us 2 seniors next to a family of 4 kids. Then they charge us $5.00 a day for our 4lb Yorkie a service dog that does not go outside. When asked about this charge after we've parked (we were not told of this daily charge at check on)I was inform that's their policy. I will ALWAYS ask this question when making reservations. I have never in 3 years been charged for my dog. We camped at Monroe Co. / Toledo North KOA in a Motorhome. The campground was crazy busy on the weekend but emptied out during the week. They have a bunch of things for kids to do so I can understand why. We were there to visit family and work since it was close to family and had a decent cell signal that all worked out fine. However, not having children with us and not wanting to dodge children everytime we stepped outside I wouldn't stay here if it wasn't for location and cell signal. We camped at Monroe Co. / Toledo North KOA in a Travel Trailer. A little too pricey for my taste but it was near where I wanted to be and just off the highway with a good signal. If you have kids they will enjoy it, especially the large servings of good ice cream you can get from their ice cream stand. Check-in easy. Sites are lower than area around them. If it rains, you will be in mud. Very large pancake breakfast. Large playground; lake with sandy beach; fishing. We camped at Monroe Co. / Toledo North KOA in a Fifth Wheel. We went to Ford Motor Co. and Henry Ford Museum ( a must visit ). Friendly, helpful staff. This campground is obviously geared to families with children. If you are a senior with no desire to participate in hayrides or the "free" pancake breakfast, be sure to request NO resort fee when you make reservations. Few satellite-friendly sites, although cable TV is included on many sites. Would stay again as it is the only campground near family and friends in Toledo. We camped at Monroe Co. / Toledo North KOA in a Fifth Wheel. Mud Hens baseball, Toledo Museum of Art. We've camped here several times due to proximity to family and friends in Toledo. 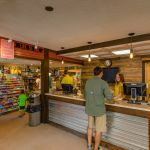 Note: the campground automatically adds a daily $7.50 "resort fee" on check-in. The fee apparently includes morning pancakes and kid's activities. As a senior, when I questioned the resort fee, I was given the option to opt out. Many sites are satellite-unfriendly, so if that is important to you, be sure to let the host know. WiFi was surprisingly good, but then the campground was mostly empty. I really wish there was a more reasonably priced option close to Toledo. We camped at Monroe Co. / Toledo North KOA in a Fifth Wheel. Right beside the highway so there was road noise. Park mostly empty. Cable and WiFi good. Water pressure good. Abit overpriced, had to pay a $6.00 resort fee on top of the regular rate. Sites close together. We camped at Monroe Co. / Toledo North KOA in a Travel Trailer. This KOA was awesome! Everything was clean, many many kids activities, amazing dog park, waterside and nice pond. Obvious that it is well taken care of. Staff is so over the top friendly, happy, smiling, super accommodating and great with the kids. Very impressed. We camped at Monroe Co. / Toledo North KOA in a Travel Trailer. 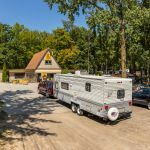 We have stayed at Monroe Co. KOA several times, but only because it is the closest campground to family and friends in Toledo. This KOA, like others we've stayed in is overpriced. The on-line rate was $45, but when we checked in, the clerk said it would be $53. When I inquired about the difference, was told the $8 was a "resort fee." The clerk removed the $8 when I convinced him we were not interested in the "free" pancake breakfast, etc. WiFi was so-so. Also, as with many KOAs most sites are not satellite friendly. We were fortunate to get one that was. We camped here three days, but had to leave Friday as they were solidly booked and we didn't have a reservation. No problem there, but when I inquired if I could just dry-camp over the weekend, the response was "sure -- that will be $41 per night." Needless to say, we packed up and moved our rig to Cabelas, which is quite nice (and free). We camped at Monroe Co. / Toledo North KOA in a Fifth Wheel. 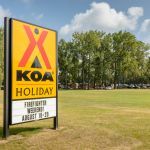 KOA is a popular named campground but that's what you are buying, is the name. Overall cost was a bit high and everything the kids wanted to do cost money. There was nothing but a small store and snack shack so we had to go to Pirolli Park for our beer and pizza. There seemed to be no type of security and there was lots of rowdy people. Won't be coming back. Sorry, but we will going to another local campground that had what we needed. We camped at Monroe Co. / Toledo North KOA in a Motorhome. We camped with 2 other families for one of their "Hallowe'en Weekends" and our Canadian Thanksgiving and we had a great experience! All of the staff was very friendly, the sites were scenic, the bathrooms were clean, and there were many activities to keep the kids busy. We would also like to thank the 2 staff members who were kind enough to boost the battery in our van when we left all of the lights on as we were loading to leave! We are already looking forward to next year. We camped at Monroe Co. / Toledo North KOA in a Tent Trailer. 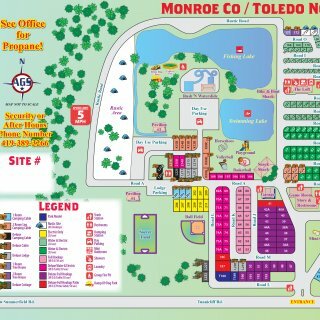 Are you affiliated with Monroe Co. / Toledo North KOA ?